…if the election were held today, we would expect Gregoire to have about a 97% chance of winning the election. Today, SurveyUSA released the result of a new Washington state poll on Gregoire’s approval. The poll of 600 adults gives Gregoire a 51% approval versus a 44% disapproval, and 5% who are unsure. Gregoire does best in the Seattle metropolitan region with 54% approval to 43% disapproval. But even in Eastern Washington, she has a positive spread: 49% who approve to 45% who disapprove. Fully 75% of Democrats approve of the Governor, but one out of three Republicans also approve of her performance. One seemingly concerning finding is among “independents:” 38% approve and 57% disapprove. But consider this: only 27% of those polled identified as a Republican, whereas 30% said “independent,” and 38% identified as a Democrat. It’s a safe bet that the “independent” category is inflated by a number of right-leaning folks who are ashamed to call themselves a Republican. After a highly contentious, close election, followed by a multi-million dollar Republican dis-information campaign (a.k.a. the election contest), Gregoire’s approval–disapproval spread started out strongly negative, and remained in negative territory for her first year in office. Then, after a 6 months period of nearly even approval (Jan 2006 until June 2006), Gregoire emerged, permanently, from negative territory. For the past 20 months, her approval has remained relatively stable, averaging 51% approval to 44% disapproval. To summarize, Gregoire’s approval numbers are stable, in the right direction, and typically over 50%. In recent head-to-head polls against Rossi, Gregoire is always coming out on top. The take-home message: Gregoire’s reelection campaign is starting out in a position of strength. Gov. Christine Gregoire was in the other Washington this week, and she joins us by phone for the first half hour. Topics of discussion will include the imminent announcement of the Air Force’s new refueling tanker contract, and how to respond if it doesn’t go to Boeing, her threat to sue the federal government over Hanford cleanup, the state of negotiations over federal funding for the State Children Health Insurance Program (SCHIP), and the state budget battle in the context of reduced revenue forecasts. Later, KIRO’s business correspondent Jason Brooks will give us an update on the tanker contract and Microsoft’s record $1.3 billion EU fine. 10AM: The race for the White House… is the campaign about to turn dirty? With one week left to go before the Ohio and Texas primaries possibly settle the Democratic nomination, strategist, pundit and blogger James Boyce joins us again for a recap of last night’s debate, and an analysis of the current state of the campaign. 11AM: Is “No Child Left Behind” making our kids stupid? Our national obsession with standardized tests as the key to education reform may have spurred marginal improvements in reading and math (or maybe not) but a new survey suggests it has done so at the expense of literature and history. Fewer than half of teens knew when the Civil War was fought, and only a quarter correctly identified Adolf Hitler. And on literature, teens fared even worse. Is our emphasis on the WASL and other standardized tests impoverishing the educations of already impoverished students, or is a liberal arts education an unaffordable luxury in a taxpayer-funded public school? Tune in this morning (or listen to the live stream) and give me a call: 1-877-710-KIRO (5476). Just a reminder, First Lady Laura Bush is in Medina today to raise money for Rep. Dave Reichert, her first fundraiser for a House incumbent this election cycle. As Darcy Burner repeatedly points out, “there are more of us than there are of them”, so let’s prove. We’re in the middle of an netroots fundraiser seeking to match the First Lady donor for donor, and we’re only about a third of the way to our 250 donor target. So if you haven’t given already, please give today, and send the message to Reichert that he won’t be rewarded for his loyalty to the Bush administration. Join us at the Seattle chapter of Drinking Liberally for an evening of politics under the influence. We meet at 8:00 pm at the Montlake Ale House, 2307 24th Avenue E—some of us show up a little early for dinner. Tonight’s theme song is inspired by Gen. Casey, who testified before a Senate panel today that the Army is under serious strain and is headed for a train wreck if troop deployments are not shortened: Casey Jones by the Grateful Dead. There are rumors that the podcast will return to Drinking Liberally this evening. The story of former Alabama Governor Don Siegelman and how he ended up in prison is an extraordinary story that I haven’t been paying close enough attention to until recently. 60 Minutes dug into the story over the weekend (video here) and makes it clear what can happen when people who are supposed to be carrying out justice are instead pursuing political ends (and for reasons that are still somewhat unclear, the broadcast of 60 Minutes was blacked out in parts of Alabama for just the Siegelman story). The whole thing is chilling, and Larisa Alexandrovna has a post that rounds up the reporting done at Raw Story and elsewhere. Other than that, consider this an open thread. Today at 5:30pm, Starbucks’ across America will be closing early to train their staff on how to make better coffee. Mark Gardener of the Whacky Nation blog announced some changes as well. Frankly, I don’t know how successful these guys are going to be, but I’m looking forward to better espresso. 9AM: Does God hate me? Sure, I’ve got a thing for women, but God knows I’m not the most macho guy in the world. So… does God hate me? Rev. Ken Hutcherson of Kirkland’s Antioch Bible Church joins me at the top of the hour to explain why “God hates soft men,” and what lies in store for inveterate softies like me. Also, a new Pew study shows more and more Americans switching religious affiliation, with barely 51% of Americans identifying as Protestants, just 43% amongst 18 to 29-year-olds. Hmm. I wonder why? 10AM: Could John McCain lose over the Iraq War? Better question: could John McCain be more out of touch with the American people? McCain told reporters yesterday that to win the White House he must convince a war-weary country that US policy in Iraq is succeeding. Meanwhile, Hillary Clinton blasts Barack Obama as unready to be Commander in Chief due to his “naive” statements on foreign policy, while Obama points to Clinton’s vote authorizing the war as evidence of the limits of experience. 11AM: Are you ready to clear cut the Fun Forest? Plans are emerging for a $600 million redo of the Seattle Center that would clear cut the Fun Forest in favor of a splash park and an ice skating rink, replace Memorial Stadium with an amphitheater, and renovate the Center House to meet ritzy, 21st Century dot.com Seattle standards. Is it worth the price tag and worth what we’re losing? 11:30AM: Do teens and driving mix? [Time Permitting] More and more teens are putting off getting their drivers license? Is that a good thing? Should we raise the driving age? And if so, what do we need to do to help teens achieve a carless existence. Last summer George W. Bush came to Bellevue WA to raise money for his friend and ally, Rep. Dave Reichert (WA-08), and to thank him for his unwavering support of the president’s policy in Iraq. In response, local and national bloggers joined together to raise an unprecedented $124,000 for challenger Darcy Burner, from over 3,200 netroots contributors… over a weekend in August. Amazing. President Bush has yet to make another foray into a district sporting a netroots challenger. But this Wednesday, First Lady Laura Bush will be in Medina WA, headlining an exclusive, $500 per person fundraiser in an effort to jumpstart Reichert’s flailing campaign, and… well… we just can’t let this happen unanswered. That’s why we’re joining together again in an effort to raise 250 additional contributions over the next few days. As Darcy says, there are more of us than there are of them. Help us prove it, and send the message that Republican congressional candidates can’t profit by toeing the Bush line. Every little bit counts, so please give today. Washington Gov. Christine Gregoire should be celebrating her state’s robust economy and record exports. Yet sagging tax collections are lowering an estimated budget surplus by $400 million. In this slow economy, states are struggling. People are spending less and state governments are taking in fewer dollars. The financial bottom line is a top worry for many governors in discussions as their annual meeting about paying for public works and energy projects. “Everything’s been going great for us and now the national downturn has slowed us up,” said Gregoire, a Democrat. State governments have to do the heavy lifting whenever the federal government shirks it’s duty. Gov. Gregoire has made some tough choices but always looks out for those who don’t have lobbyists to make their case. I mean, who’s going to stick up for kids without health care? Students? Seniors? Not Dino Rossi, thats for sure. Rossi, a Bush Republican, named his dog after the president. Or “Dubya,” I’m not sure exactly. The speaker and I had a very cordial meeting and there were no threats at all. I can confirm that several of my colleagues have been asking me to reconsider my decision to not seek reelection. A number of consumer advocates have been asking me to stay as well. They are all worried about a real void in consumer protection leadership. I am worried as well. I have told them that I would at least think about it and that is all I have to say about this issue for now. So Sen. Weinstein confirms that colleagues and consumer advocates are urging him to run for reelection, and he’s told them that he would at least think about it. No “threats” were made during his meeting with Speaker Chopp, but that doesn’t mean there wasn’t an elephant standing in the room with them. It didn’t make any local media reports. But last Friday, a deal was struck in the state legislature that could fundamentally change how elections are held in Seattle. The deal concerned two identical bills with different numbers that had been overwhelmingly passed by the Senate (29-20) and the House (56-38). Because the bills had different numbers, one had to be passed by the other chamber, by this week, in order to be forwarded to the governor’s desk for her signature. And the Senate version, championed by the venerable Sen. Rosa Franklin, won out. (It’s amazing how much of Olympia’s legislative process comes down to personalities. It’s like middle school on steroids.) Gov. Gregoire is expected to sign it into law. Oh, the bill? It would allow local jurisdictions (cities or counties) to hold referenda on public financing of elections. And Seattle is at or near the top of the list of Washington cities likely to put such a measure on the ballot in November 2008. The path, then, to a November 2008 Seattle ballot measure is fairly clear: a bill already approved by a supermajority in the House, a governor likely to sign it into law, a city council overwhelmingly supportive. And local activists are already working on what that public financing model might look like. Most likely is some variation of the “Voter-Owned Elections” law passed in Portland, Oregon, in 2005. In the Portland law, any candidate who raises 1,000 $5 donations can then qualify for $150,000 in city money, provided he or she agrees not to take further private contributions. The upshot of all this is that last Friday’s deal ensuring Olympia’s passage of a measure allowing local public financing could fundamentally reshape our elections – and that almost certainly that decision will be in the hands of voters, perhaps as soon as November. Less likely, but also possible, is a King County measure – I-134 also struck down a public financing law in King County. Just think of how differently the Port of Seattle might be run if commissioners, earning a few thousand dollars a year, weren’t getting far more than that in contributions primarily from businesses that have dealings with the Port. Ultimately, public financing of elections doesn’t just mean better elections; it also means a less corrupt government. And that’s well worth the relatively small amount of public funds needed to make it happen. 9AM: Does God hate “soft” men? If so, I’m in trouble. Valerie Tarico, a Seattle psychologist and former fundamentalist Christian will join us by phone to tell what kind of preaching she’s heard in her survey of local churches. We’ve got a call out to Rev. Ken Hutcherson, hoping he can come on the show and explain to us his controversial take on gender roles: “If I was in a drugstore and some guy opened the door for me, I’d rip his arm off and beat him with the wet end.” Because… um… Jesus loves you. 10AM: Is a “virtual” fence a real solution? A $20 million, 28-mile, Boeing built “virtual fence” is ready for service along the US/Mexico border near Nogales, Arizona, and the Minutemen outraged, saying “virtual fencing is virtually useless. Minuteman National Executive Director Al Garza joins me by phone to make his argument for a double-layered physical barrier along our entire Southern border. Ralph Nader announced yesterday that he is running for president, surprising absolutely nobody. The man credit by some with playing spoiler and throwing the election George W. Bush, claims that he is to “shift the power from the few to the many,” but netroots activists like me remain dubious. 100,000 Washington voters cast their ballot for Ralph Nader back in 2000, and one of them was former Seattle City Councilman Peter Steinbrueck; he joins us to give us his current opinion of Nader and his candidacy. The Washington Poll released a new poll this week in the Washington state gubernatorial race. The results are pretty good news for Christine Gregoire, as it shows her leading Dino Rossi 53.7% to 42.1% with 3.5% undecided. The survey’s margin of error is +/- 5.6 percent. That means any number could be off by as much as 5.6 percent in either direction. And that means that Gregoire’s lead could be anywhere from nearly zero to more than 20 points. A poll’s margin of error specifies a range that should include the true value (i.e. true percentage of the population who say they would vote each way when the poll was taken) with a 95% probability. For this poll, the interval of Gregoire voters defined by the margin of error is 48.1% to 59.3%. But the true value could fall outside this interval—anywhere from 0% to 100%. That the true percentage is outside the interval is only less probable, not impossible. But even within the range 48.1% to 59.3%, all outcomes are not equally likely. The most likely true value supported by the data is 53.7%, and values near the tails (like 48.1% and 59.3%) are much less likely. Polls have a margin of error because a small number of individuals are “sampled” in a poll. The same principle applies to flipping a coin. If you toss an honest coin 10 times, you expect 5 heads and 5 tails (i.e. a probability of 50% which is the true underlying probability for an honest coin). Typically, you will not get exactly 5 heads. If you repeat this 5-flip experiment, say, a hundred thousand times, and plot the results, the most likely outcome—five heads—only occurs about one quarter of the time. Occasionally, you would even get 10 heads in a row (about 0.1% of the time). On the other hand, if you flip an honest coin a million times, the results will be very close to half heads and half tails. Back to politics. Given that the Washington Poll sampled 300 individuals and found a 53.7% to 42.1% split, we can do a reverse engineered version of the coin flip experiment. We can simulate elections over and over again with 300 individuals who, for every election, each have a 53.7% probability of voting for Gregoire, a 42.1% chance of voting for Rossi and a 3.5% chance of being undecided (i.e. not voting). We can then plot the resulting number of votes for Gregoire in all of the elections. 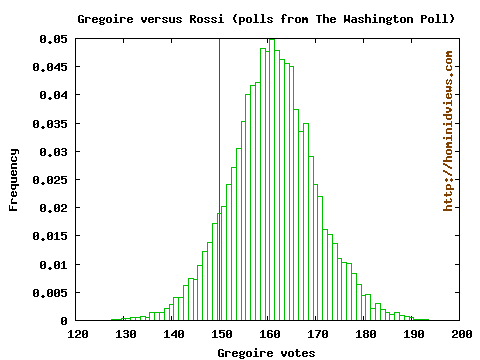 Vote totals to the right of the red line are wins for Gregoire and those to the left are wins for Rossi. Clearly, the vast majority of the wins are for Gregoire. In fact, she won 96,581 of the elections and Rossi won 3,032 of them. In other words, if the election were held today, we would expect Gregoire to have about a 97% chance of winning the election. There was another Washington Poll for this race taken late last October that showed Gregoire leading Rossi 46.8% to 42.4%. That poll sampled 601 individuals. Repeating the simulation exercise shows that Gregoire had an 88.7% probability of beating Rossi based on results from that poll. So, we could say that Gregoire’s support has probably improved from the previous poll to the current poll. The story might end there, except that the newest Washington Poll actually resampled 300 individuals from the 601 participants from October, rather than drawing a new sample. This highly unusual political poll design provides for stronger hints about the trend in support for each Candidate than does two polls of randomly sampled voters. A proper analysis would require access to the raw data, but the increased spread sure looks promising for Gregoire. “No Country For Old Men” wasn’t better. The ending sucked. Yes, Javier Bardem was amazing as the sociopath killer with the awful haircut, but nothing beats George Clooney’s turn as the “fixer” who gets to the bottom of a mysterious case in “Michael Clayton”. 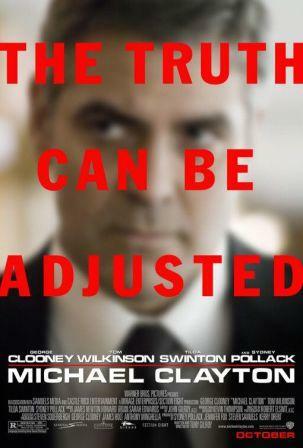 “The Truth Can Be Adjusted,” indeed.